HomeAsylum SeekersUnited Against Racism Camping Launch: End Direct Provision System! United Against Racism Camping Launch: End Direct Provision System! 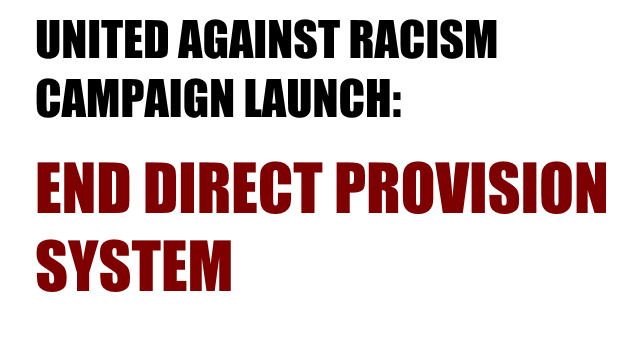 United Against Racism is building a campaign to abolish the Direct Provision System (DPS). Introduced more than 1 5 years ago as a 6-month temporary solution to address the accommodation needs of asylum seekers, the DPS has become a permanent inhumane entrapment for many. There are currently around 5,000 people in DPS centres with 1 5% there more than 8 years. The average time asylum seekers spend in DPS is 38 months. Asylum seekers in the DPS are not allowed to work, and don’t have access to 3rd Level education. A weekly allowance of €1 9.1 0 per adult and €1 6.60 per child is payable to asylum seekers living in direct provision As reported many times before the DPS is an oppressive discriminatory system and the asylum seekers, adult and children, isolated in DPS centres face serious physical and mental difficulties. DPS centres are proven to be extremely unsuitable for children to grow up in. The previous FG/Labour government had promised serious reforms to DPS and the asylum process but after long waiting this came to nothing. Direct provision reform is not in the new government programme. United Against Racism is building a campaign against the institutional racist Direct Provision System and calling on the government to abolish it and give the 5000 people trapped for so long in this system the right to permanent residency,and the right to work and education and protection. UAR is calling on all anti racism activists to join the campaign. Direct Provision System: Why it must end?